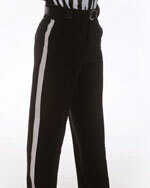 Smittys black football pants come with the standard 1 1/4" white stripe down the sides in even sizes from 30-54. Wind and water resistant to stand up to the elements. Tunnel beltloops, two set in back pockets and deep front pockets. Unhemmed. Ordering Note: The pants are running a little small. If you're between sizes, we recommend you go up.